In a sign of simmering tension at the top of one of the nation's largest media giants, Walt Disney Co. vice chairman Roy E. Disney stepped down from the board of directors and called on chairman and chief executive Michael Eisner to resign in a scathing letter. "It is my sincere belief that it is you that should be leaving and not me," Disney wrote to Eisner. He also accused Eisner of "muzzling" his voice on the board. Disney's departure may be a pre-emptive move to avoid being forced from the board of The Walt Disney Co. He is the nephew of company co-founder Walt Disney and the last family member to be active in the company. The board's governance and nominating committee decided against recommending the 73-year-old Disney for another term because he is over the mandated retirement age of 72, the company said Sunday. Board membership is on the agenda for the full board's scheduled meetings Monday and Tuesday in New York. Disney has called for Eisner's resignation in the past, but the idea was rejected by the board. On Sunday, he sent a three-page letter to Eisner that criticized the chairman's leadership over the past seven years, according to The Wall Street Journal, which first reported the story. "Michael, I believe your conduct has resulted from my clear and unambiguous statements to you and the Board of Directors that after 19 years at the helm, you are no longer the best person to run the Walt Disney Company," Disney wrote. The board's presiding director, former U.S. Sen. George Mitchell, said in a statement Sunday he regretted Disney's actions and confirmed that the governance and nominating committee recently informed Disney that the age-limit rules should apply. "It is unfortunate that the Committee's judgment to apply these unanimously adopted governance rules has become an occasion to raise again criticisms of the direction of the Company, and calls for change of management, that have been previously rejected by the Board." A call to Roy Disney on Sunday was not immediately returned. 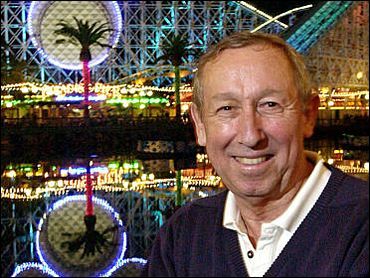 Disney previously resigned from the board in 1984 to initiate a stock battle for the company while it was headed by Ron Miller, Walt Disney's son-in-law. Disney was later reinstated. Eisner is credited with transforming Disney from a minor producer of mediocre films and caretaker of two theme parks in 1984 into a media giant, whose holdings include five theme parks around the world, the ABC TV network, the ESPN sports cable channel and one of the highest-grossing movie studios. Eisner's has taken heat for what critics see as micromanaging leadership style. Detractors also accuse him of presiding over a "brain drain" that saw top executives leave the company over the past 10 years, including former studio chief Jeffrey Katzenberg, Steven Bollenbach, who now heads the Hilton Corp., and most recently Paul Pressler, who left last year to head Gap Inc.
Roy Disney also blames Eisner for a loss of morale at the company and for causing a perception that "the Company is rapacious, soul-less, and always looking for the 'quick buck' rather than the long-term value which is leading to a loss of public trust." He also blasts Eisner for the failure to maintain constructive relationships with business partners, including Pixar Animation Studios, which co-produces computer-animated films with Disney, including the record-breaking "Finding Nemo." Disney's stock has fallen from more than $40 per share in 2000 to under $14 in 2002. The stock has risen nearly 34 percent since the beginning of the year as the company's fortunes have gradually improved. In September 2002, Eisner's plan for improving the company was unanimously approved by the board, but only after months of often bitter infighting among board members about the company's declining fortunes. The plan included the most drastic changes in board membership since Eisner became chairman, such as bringing more independent members to a board that had long been criticized as having too cozy a relationship with Eisner. Since then, another vocal Eisner critic, Andrea Van de Kamp, was dropped from the board. Two other board members who will not be re-nominated this year due to the age limit are 76-year-old Thomas S. Watson and Raymond Murphy, 77.